Matthew Hill started making furniture aged 16. His ebullient passion for his craft spills over into his imaginative designs which have been displayed all over the country and were recognised with an award at last year's Celebration of Craftsmanship & Design. He takes inspiration from a variety of sources and enjoys close collaborations with his clients. Matthew Hill: I am currently working on a few commissions, but there is one project in particular I am very excited about. It's a beautiful console table for a wonderful couple who have let me run free with the design; an organic-feeling, clean and crisp piece, which complements the chosen room where it will be set in. MH: From a young age, my main interest was furniture; creating something with care and attention which someone else can also make the same connection with and share those feelings in. 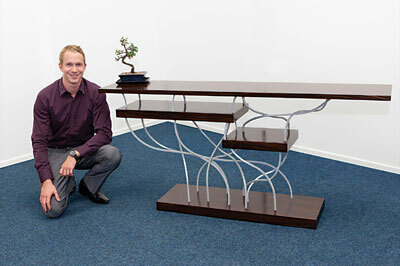 My love for furniture design and making grew through college and university and making furniture in Ireland. MH: Straight lines and right angles are a no-go for me. I am truly inspired by nature and movement. Many designer/makers draw inspiration from nature. But my interest lies in creating a story for the viewer to recognise and be drawn into and appreciate; the ability to make the viewer's eyes flow around the piece, seeing the story right in front of them. I love to draw contrasts which relate to the story of the piece to make the viewer really think about what they are looking at. MH: A style of music which appeals to all. Interesting harmonies and melodies, something to focus on and appreciate the work effort. Also, something as pleasing to the ear as it is pleasing to the eye. MH: Any work where the balance has been struck just right to make a pleasing piece without overcrowding the design and form. Many names in the craft world spring to mind. MH: Two names have been very involved in my career. When working with Joseph Walsh, he showed me the true side to the combination of art and furniture, a fantastic and supportive mentor and role model. Matthew Collins has also been a very supportive mentor. The knowledge he holds is second to none. MH: The two work hand-in-hand. Design is the first thing which springs to mind. But in a split second, technique jumps forth which opens up many more exciting possibilities in the design. MH: I think not. Traditional ways are often used, although part of the fun is adapting those modes of work to create new processes and techniques. MH: My work is predominantly recognised through exhibitions in the UK, although there are plans to move forward into the USA and Milan where there has been interest. Satisfied clients share as much interest in their pieces as I do, so their words are key for me. MH: I cannot put my heart and soul into a piece if it has not been mine from start to finish. I therefore never have done or never will work with someone else's design in my work. MH: I work with what I want the theme of the desired outcome to be. With this in mind, I then research and make my own connections with the story. When your own connections and interests are made with the piece it is a true joy to work on it and develop the design. This involvement and passion in the story of the design is shown in the final piece for the client to appreciate and share. MH: Personally, I describe myself as a designer/maker. It is important to me to have the two titles which cover both topics of work. Although regularly the word 'artist' is used as my creativity takes over when I create a piece. MH: After meeting with my clients, I get a true sense of them as people so I can make the piece around them as well as my inspirations. Sketches and detailed drawings are important, although I cannot stress enough the importance of models. These are a great way to show the finished outcome and understand the proportions of the piece. MH: Not in the slightest. There is always going to be a desire to own a bespoke piece, something which is so much more than a piece of furniture. MH: Always stick to your own style of work so you can enjoy it to the utmost. If you are passionate about your designs and work, then people will share the same passion and be interested in you as a designer/maker as much as their interest in your work. MH: When people ask if there is a need for bespoke furniture. Designer/makers like me are in this job for the joy and passion. The people who buy bespoke work share the same passion and interest in one-off pieces. Anything I make is much more than merely an object in a room. People appreciate that and the market is very much there.